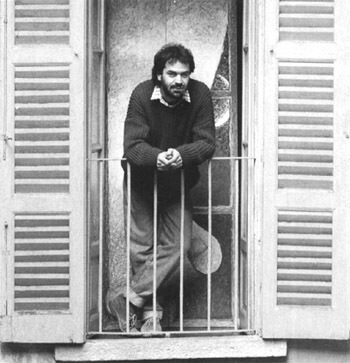 Emilio Alberti was born in 1952. His body of work ranges from painting, sculpture, installations and applied art. 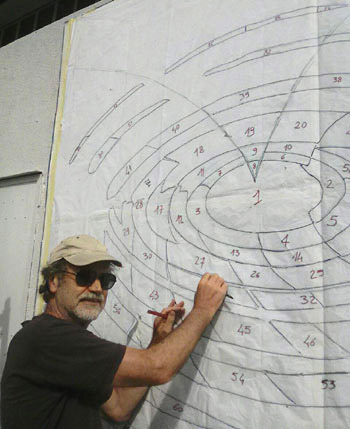 His work has been featured in numerous solo and group exhibitions since 1974. In 1976 he took part in ART BASEL 7 ' 76 and the following editions of '77, '78 and '82. An extensive exploration of materials pervaded his works. His wish to explore various means of expression led him to venture into the fields of photography and performance, like "MY SELF FOR SALE" at Art Basel in 1978 and "ICARUS FLIGHT" in Fabiano (Lucca) in 1985. In 1984/85 he had numerous stays in Germany and Belgium exposing in Bonn, Frankfurt, Stuttgart, Brussels and Anvers. In 1985 he experimented with cut and painted "Papers" composed on the wall. 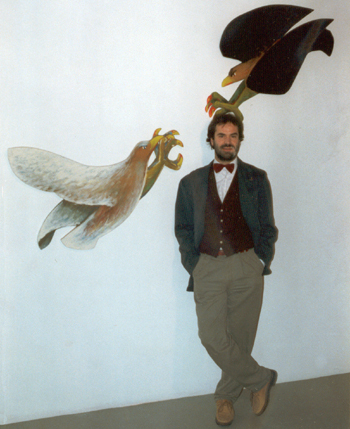 Afterward in 1986 he worked with shaped boards, the "SCULPTURE-PAINTINGS" in wood or PVC: three-dimensional works that related painting and sculpture to the space where they were placed. In 1986 he exposed his marbles in Como in Saint Fedele square. After these experiences, there was a period of experimental didactic activity in the school. In the same year he participates to "Pencil on paper" in Como, edited by Luciano Caramel. In 1987/88 he collaborated with the sculptor Francesco Somaini at the realization of a monumental work and he realized some stage designing for Città Murata Theatre in Como. In 1988 he exposed at Schubert gallery in Milan the "WINDOWS" series accompanied by a poetical-literary text by Gérard G. Lemaire. In 1989 he was invited at "ITALIAN CONTEMPORARY ART" at Kyoto Art Museum and prepared an exhibition at the castle of Carpi (Modena) by the Contemporary Art Documentation Center. In 1991 he exposed again at Schubert gallery and, at the same time, at Il Salotto gallery in Como, with the one-man show "INCOHERENT ETERNITY" edited by PIERRE RESTANY, publishing for that occasion a book of short stories inspired by his works. In the same year, he was invited to the Piero della Francesca celebrating exhibition in New York, Buenos Aires, Florence, Rome, Urbino. In 1992 he realized an installation at MARCONI gallery in Milan and his works were reproduced on several covers of "PSYCHOLOGOS" and "FLARE ARCHITECTURAL DESIGN" magazines. In 1993 the Culture Councillorship of Como planned the exhibition "EMILIO ALBERTI - TEMPO REALE" with works purposely created to reinvent the spaces of the ex-church of S.Pietro in Atrio and he was commissioned to make the monumental sculpture-pendulum "PERPETUUM MOBILE" for the square in front of the lake and now it is placed at Ca' d' Industria Institute in Como. He realized an installation on the TEMPIO VOLTIANO building in Como. In 1994 he was invited at ARTEXPO in New York and organized with other artists the environmental art exhibition "A FILO D'ACQUA", floating sculptures in the lake of Como. In the same year the one-man exhibition "TALES OF SOLSTITIUM" at Schubert Gallery in Milan. In 1995 and ' 96 he made various installations in public spaces. In 1997 the Gallery Il Salotto of Como set up the show "TRACES". In 1998 he started a research on the interaction between music, visual art and environment, creating the sound-visual "SECRET PLACES" with the musician M.Mora. In 2000 he exposed at La Fenice Gallery in Lugano, Switzerland. He found "ARTEMI art project", an interdisciplinary project joining experimentation and research in the field of design and applied arts. In 2005 he was invited at Ankara BIENNALE, Turkey and at ArtCard, at Art Museum of Arab Emirates. In 2006 he exhibited his research about water in "WATER GAMES" at Villa Imbonati, Cavallasca, Como. He keep on with the technique worked out for this series, based on stucco, oil colours, metal relief on canvas. In 2008 the exhibition ?D?Acqua e Terra? at San Fedele Intelvi by Culture Councillorship of the Province of Como. In 2009/10 "TERRE LIQUIDE", paintings and ceramics, at Il Salotto gallery , Como. In 2011 "LIQUID WORLDS", retrospective by the Culture Councillorship of Como at the ex-church of San Pietro in Atrio. In December 2011 he realized the cover image for the magazine CID. Puplished by the Oxford University Press, USA. In 2012 "PER MARI APERTI" at Villa Sormani, Mariano Comense (Como). Culture Councillorship. And "THE HOURS OF THE SUN" at Palazzo MILLEPINI, Asiago (Vicenza) by the National Institute of Astrophysics and Astronomical Observatory of Padua. In 2013 "WATER", at Monastery of S. Maria del Lavello in Lecco, Italy, personal exhibition and cultural project in collaboration with artists of other disciplines. In the same year he exhibits the "LABYRINTHS" series at San Pelagio Castle in Padua, Italy, by the Museum of Flight. In October the exhibition "PROVA D'ARTISTA" multiples, ideas, objects, at Il Salotto Gallery, Como. The same gallery release at the end of the year the Artist's book "ACQUA". In 2014 "Labyrinths - Metaphors of knowledge" in the City Library of Como , Italy, by Como Culture Councillorship. In 2016, "WATER", with poetic speeches at Palazzo Ducale in Revere (Mantua). Meanwhile, continues his research on the interaction between music, visual art and environment with "Events in Studio", in which invites musicians to interact with his works. In 2017 "VERTIGO" in Como, Palazzo del Broletto, by the Culture Councillorship. The same year was inaugurated his public work "PETUL", a large ceramic mural on the lakeside of Dongo, Como Lake.He also creates the installation of environmental art "PASSAGE" in Milan along the Martesana Canal. He won the Premio COMEL Contemporary Art Prize Audience Award. In 2018 in Dongo was commissioned another wall mural "FLIGHT", a flight of doves symbol of peace near the place where Mussolini was arrested and the fascist leaders was shot in 1945. In june the solo exhibition "AFTER THE STORM" at Spazio Comel, Latina. From August to November the Extrafid ART Foundation sets up in Lugano, Switzerland "EMILIO ALBERTI" paintings and Artist Books.